Latino males are effectively vanishing from the American higher education pipeline. Even as the number of Latinas/os attending college has actually increased steadily over the last few decades, the proportional representation of Latino males continues to slide relative to their Latina female counterparts. The question of why Latino males are losing ground in accessing higher education—relative to their peers—is an important and complex one, and it lies at the heart of this book. There are several broad themes highlighted, catalogued along with the four dimensions of policy, theory, research, and practice. The contributors to this book present new research on factors that inhibit or promote Latino success in both four-year institutions and community colleges in order to inform both policy and practice. They explore the social-cultural factors, peer dynamics, and labor force demands that may be perpetuating the growing gender gap, and consider what lessons can be learned from research on the success of Latinas. This book also closely examines key practices that enable first generation Latino male undergraduates to succeed which may seem counterintuitive to institutional expectations and preconceived notions of student behavior. Using narrative data, the book also explores the role of family in persistence; outlines how Latino men conceptualize fulfilling expectations, negotiate the emasculization of the educational process, and how they confront racialization in the pursuit of a higher education; uncovers attitudes to help-seeking that are detrimental to their success: and analyzes how those who succeed and progress in college apply their social capital – whether aspirational, navigational, social, linguistic, familial, or resistant. While uncovering the lack of awareness at all levels of our colleges and universities about the depth and severity of the challenges facing Latino males, this book provides the foundation for rethinking policy; challenges leaders to institutionalize male-focused programs and services; and presents data to inform needed changes in practice for outreach and retention. "A country’s most precious resource is its human resource. Therefore understanding why the number of Latinos males diminishes as they move through the education system is critical. Using this robust compilation of analysis, practice and scholarship, educational leaders now have vital information about the current condition and how to change the flow of Latino male talent into higher education, the workforce and civic leadership. The question remains when will higher education act to respond to the challenge?" "There has been substantial evidence for some time that Latino males are underrepresented in higher education. In this important new book the authors examine four critical dimensions of the problem: policy, theory, research, and practice. The contributors to this book present important new research on factors that limit and promote Latino success in both four-year institutions and community colleges. For policymakers and practitioners this book will be an invaluable and insightful resource." "Sáenz, Ponjuan, and Figueroa are leading experts on this topic. I therefore find unsurprising the brilliance evidenced in this book. 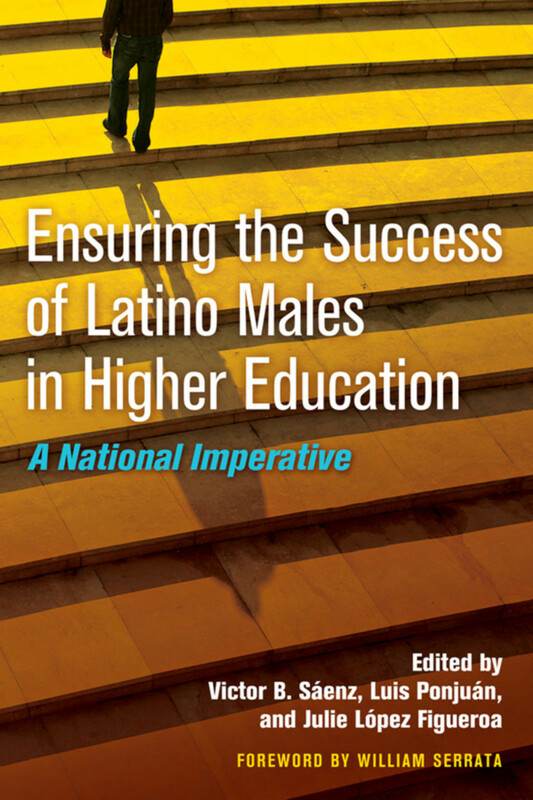 Anyone who is serious about ensuring the success of Latino men in higher education will surely find much inspiration and guidance in this important text." Victor B. Sáenz is currently an assistant professor in the Department of Educational Administration at the University of Texas at Austin. He is also a Faculty Fellow with the Division of Diversity & Community Engagement and a faculty affiliate with the Center for Mexican American Studies. Dr. Sáenz received his PhD (2005) and a Masters degree (2002) from UCLA in Higher Education & Organizational Change. He also holds a Master’s degree (1999) from the LBJ School of Public Affairs and a Bachelor’s degree in Mathematics (1996) from the University of Texas at Austin. Dr. Sáenz was born and raised in the Rio Grande Valley of South Texas. Luis Ponjuán recently joined the faculty of Texas A&M University in fall 2012 as an associate professor of Higher Education Administration. Dr. Ponjuan earned his Ph.D. in Higher Education with concentrations in Quantitative Research Methodology and Organizational Behavior and Theory from the University of Michigan. His Masters of Science in Higher Education Administration from The Florida State University and his Bachelors of Science in Psychology from the University of New Orleans. Julie L. Figueroa is an associate professor in the Ethnic Studies Department at California State University, Sacramento. Dr. Figueroa grew up in San Jose, California and is one of four children born to Mexican immigrant and migrant parents, Macedonio and Maria Figueroa. She double majored in Sociology and Chicano Studies from UC Davis, received her M.A. in Education from UC Santa Cruz, and completed her doctoral degree at UC Berkeley.